Cheque payment is a familiar mode of making payment. You can't make cash transactions everywhere. Even, using cheque for making the payments is a safer mode in comparison to carrying a huge amount of cash. You might face some inconvenience while making transactions via cheque. What if you lose one of the cheque slips with your signature or you want to block any of the cheque payment for any reason? You can easily stop payment of cheque through online SBI without visiting the branch. You have to follow few steps in sbi net banking without any mistake. 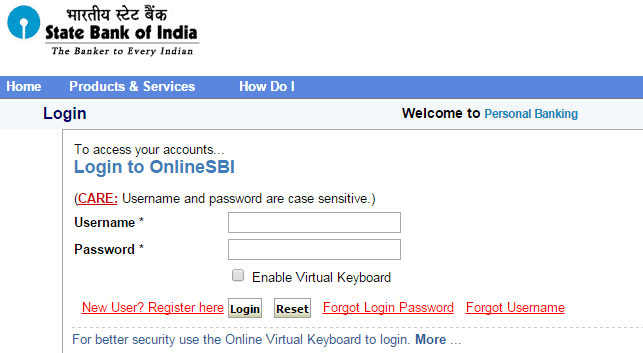 Step 1: Visit the official website of State Bank of India and log in using your Internet Banking's Login ID and Password. Step 2: Move the mouse cursor to 'Request & Enquiries tab Book. Step 3: Now click the 'Stop Cheque Payment' under request and enquiries. Step 4: Now, you have to select the account number linked to the Cheque. The next step is to enter the cheque number you want to cancel. Important Note: Enter the same cheque slip number in start and end Cheque number if it is a single cheque slip. If you want to cancel a series of cheque slips or the entire chequebook, enter the cheque slip numbers. If you don't remember the cheque slip numbers, move to 'Cheque Book Request' tab and check the history to get the details of the issued chequebook. After entering the cheque slip numbers, you need to select from the options 'Normal Cheque' and 'Multi City Cheque'. You also need to specify the reasons for stopping the payment. You will get the options to select clicking on the arrow button. Tick mark on the box 'I accept the following Terms and Conditions'. Click on 'Submit' to proceed ahead. 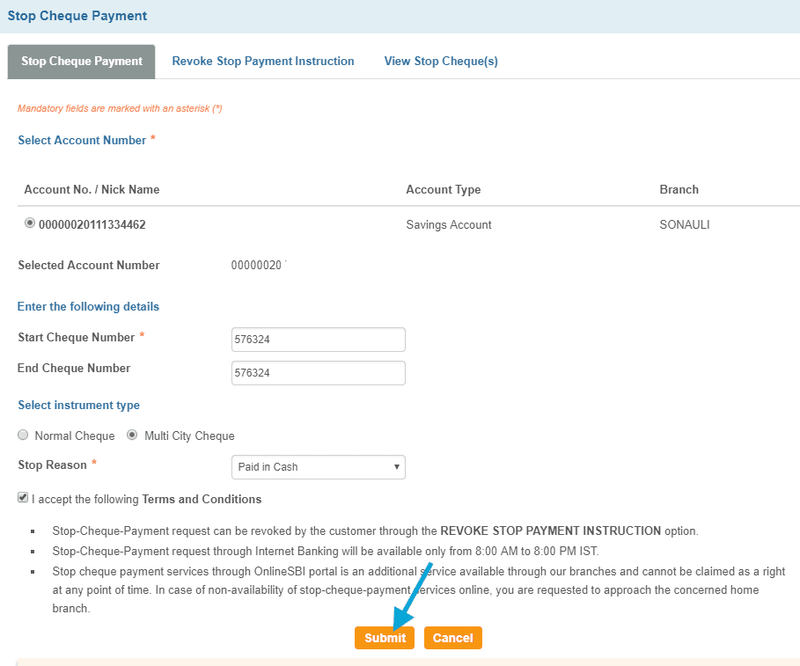 Step 5: Your request detail to stop payment or cancel the cheque will get displayed on the screen. You need to click on 'Confirm' button after verifying the details. 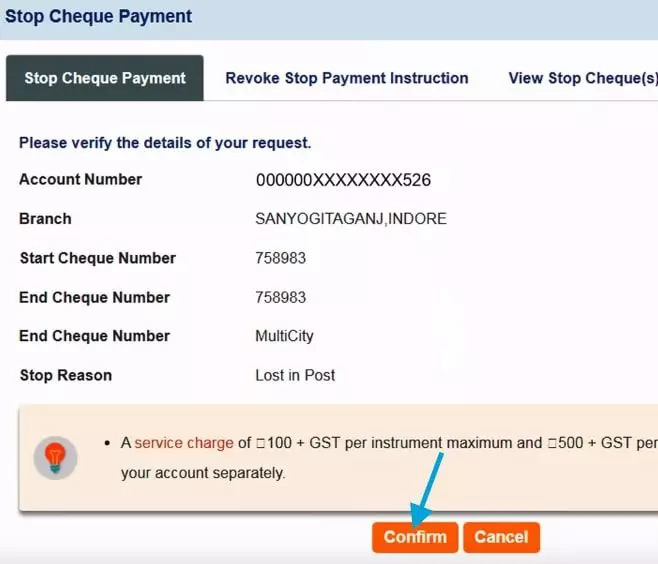 You can check the request status by selecting View Stop Cheques tab and also cancel the request by clicking Revoke Stop Payment Request. You can only check the status or cancel the request only for the request made online. Make sure to read the Terms & Conditions before accepting. You have to pay the processing fee for making the cancellation request online. You can also visit the branch for cancelling the cheque slips.